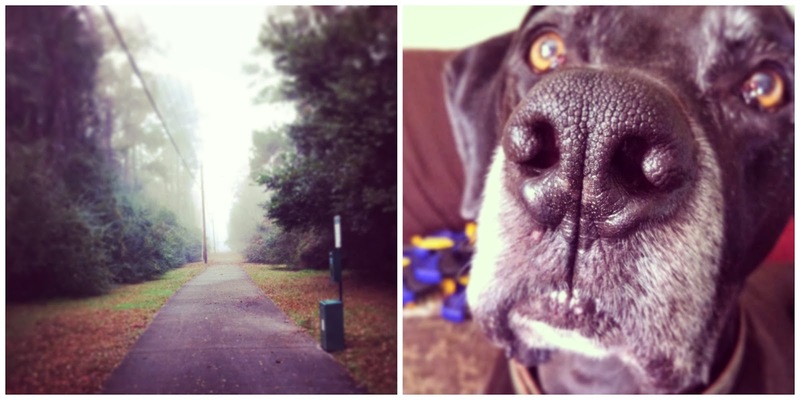 L: Foggy walk with the dogs; R: Seamus's gray snout. Friday High Five is the new name I (think) I invented for the blog tradition of listing five good things about the past week each Friday. Here we go! 1. The number one best thing that happened this week was that Nathan was hired as a full time paramedic. He's been working part time since graduation, but with full time hours, filling in for people out on maternity and/or sick leave. 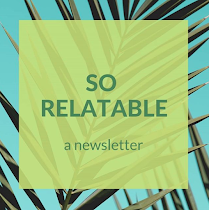 While it was great to finally have a regular income, we weren't sure how long it would last, and he wasn't receiving benefits or earning vacation time because he was still technically part time. Then a position opened up and, as of this week, he's full time! We couldn't be happier. This is the company for which he'd been volunteering during school, the one he most wanted to work for because of the people, the schedule, and the quality of the care he's able to deliver. Plus: regular income! I am so relieved that he's got a stable job that fulfills him and pays the bills. It makes me (slightly) less stressed about my own graduation and pending unemployment. WHEW. And also: CONGRATULATIONS, NATHAN! 2. My back is feeling much better! I was going to the chiropractor twice a week, then dropped down to once a week because I just couldn't afford more than that. While the doctor assures me that this will slow my recovery, he agreed it was better than nothing. That said, I'm still not sure if my back is feeling better because of the healing powers of time, or because of the adjustments, and am still struggling a bit with my feelings about the whole thing in general. If anyone out there has long term experience with chiropractic care, I'd love to hear your thoughts! Even though my back feels better, it's not 100% okay. While I can sit and lie down and walk with ease, I still can't run without pain shooting up my spine. While practicing yoga four or five times a week has been amazing (I either go to the YMCA or do a 20 minute session in my living room - YogaDownload on YouTube has some great, short classes) I was missing my cardio workouts. Then I remembered spin class, which, I discovered, doesn't hurt my back at all. The classes are an hour long, and my heart feels like it's going to burst out of my chest for most of that hour. I leave feeling wrung out and exhilarated, and am happy to say that, for now, the hole that running left in my heart has been filled. 3. As soon as I hit publish on this post, I'm going to finish my grading for the semester. I'm very excited to be done with all school related tasks until after the holidays, when I will have to write a syllabus for a new class I'm teaching - dystopian literature through decades and genres. So, while some work is looming on the horizon, it should be fairly enjoyable. Until then, I'm looking forward to submitting grades and then reading strictly for pleasure. 4. Over the past few months, a number of the people in my circle of friends have had some impressive successes, writing-wise. Prestigious awards, fellowships, great publications. I think I must have matured at some point, because instead of feeling intense envy and jealousy, I'm actually happy for them. These are talented, lovely people, and they deserve every good thing they get. I also remember something a professor once said, which is that the more the people close to you succeed, the closer you are to success. So friends: keep up the good work! I'm proud of you, and I am patiently waiting my turn. That's it for me. I hope you had a good week, and would love to hear about it in the comments. Until then, here's to a lovely weekend!